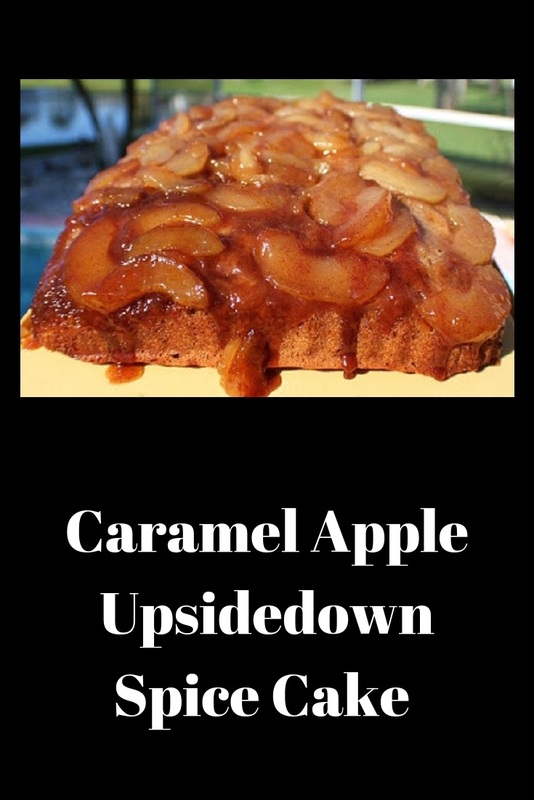 A caramel apple upside down spice cake it was amazing! Easy to throw together and was a huge hit. Sometimes you just have to use a cake mix when you're in a hurry and fool everyone that it wasn't made from scratch. This semi homemade cake will do the trick for sure and it's super yummy! Ok so you may not be a baker, but if you want to wow your guests and family, this will do it. All apple lovers will love this caramel apple cake. It surely shouts fall and is everything you can ask for in the homemade flavors. Everything bakes like magic and is one of my favorite desserts to bring anytime I need something quick. This is a basic recipe for upside down cake. If you are not an apple lover, try any other kind of pie fillings you like with cakes mixes. Peach and yellow cake are great together with caramel also. My other favorite, is chocolate cake mix and cherry pie filling, also a great combination of flavors. Semi homemade cakes will always fool the best of bakers. With all the caramel and delicious apples added, this decadent cake will be a hit no matter who you serve it too. Your secret on this caramel apple cake that's made with a spice cake mix, is safe with me! In a 13 x 9 sheet pan place the stick of butter and brown sugar in the pan then into the oven to melt them together. While the butter mixture it is making its own caramel in the oven, beat the cake mix, eggs, mayonaise and water in a mixer until thick and smooth. Take out the pan when butter is all melted, stir mixture together. Spread out the apple pie filling, sprinkle with cinnamon over the apples. Pour the batter over the top of the apples and bake until the cake springs back and set in the center around 45 minutes. After 5 minutes invert over a platter that fits the cake. Let cool. The cake holds up beautifully and doesn't stick to the pan. An amazing flavor, we were very happy with the results and diffinitely making it again! Serve with whipped cream or vanilla ice cream. Congratulations to both of you!This cake looks absolutely delicious!Have a lovely weekend,dear! Rave review! I bet this was a favorite. I love caramel, apple cake, spice cake - pure genius to cull them together. This would be grand to come home to after your frazzled days oh holiday retail! Perfect! What a tempting cake Claudia! All that oozing caramel and the apples looks delicious! Scrumptious! I love caramel apple. Wow Claudia what a great cake! Thanks. Your upsidedown cake looks and sounds absolutely delicious. What a wonderful combination, caramel and apples in a cake. gorgeous pic, too. Hope that you get some time to rest. Claudia this looks fantastic. You guys did a great job. I've added this to my list of recipes to try. Your son and I would get along well. I adore spice cake and apples. Very nice picture too! This is delicious! I can see why it was such a big hit! Oh that looks soooo good with the caramel dripping down the side! Nice "experiment" - seems like an absolute success! Ooh, that's pretty--anything with apples and caramel and spice looks good to me! Your cake looks delightful! How fun and special to create a culinary masterpiece with your son. These are memories that last a lifetime. Caramel and apples is an irresistible combo. your upside-down cake looks great Claudia! Looks fantastic! I love me some caramel apple anything! I'll be bookmarking this one for future use! This looks so good! I love upside down cakes. I think they are fun! I remember when you first posted this--it looked great then and the flavors are so appealing.